Spring brings nicer weather, but it also signals the start of allergy season. While many allergens come from the outside, it's important to not just blame pollen and other outdoor pollutants on your allergies. Keeping the inside of your home free of allergens can go a long way towards improving your health. Here's what you can do. Always turn on your exhaust fans when you're using your kitchen or bathroom. These fans don't just remove moisture and cooking smells. They also pull out chemicals from cleaning, pollutants created by cooking, and allergens your family tracked in from outside. Even running your fans for just a few minutes at a time can leave your air cleaner. Even if you can't see pollen, allergens may still be floating around outside. If you spend a long time outdoors, change clothes as soon as you come inside, handle your clothes as gently as possible to avoid shaking pollutants out into your home, and store dirty clothes in a closed hamper. If you have pets, brush them regularly, and ask your vet how much bathing is appropriate (frequent baths are not good for certain fur types). Also avoid storing outdoor furniture inside your air conditioned spaces, and don't bring indoor furniture outside to provide extra seats or tables for a barbecue or other activities. Even if you're great about changing your filters, your air conditioning system could be to blame for your allergy problems — remember, it moves all of your home's air. The evaporator coils and blower fan can become filled with dust and other pollutants that got through your filter, and this will dirty all of the air that passes through your system. Old or leaky air ducts could also be responsible for pulling in or trapping additional pollutants in your system. 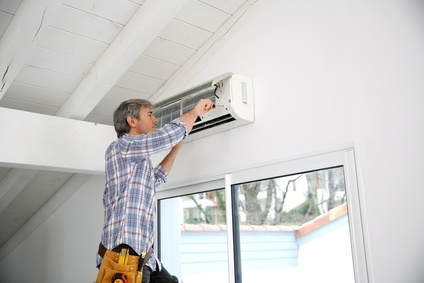 To ensure the clean and efficient operation of your air conditioner, schedule a tuneup each spring.